THE UNOFFICIAL CHER AFTER PARTY – FIVE YEARS OF PROPAGANDA! KITTY GLITTER is coming back to Auckland to spin at the fifth anniversary edition of PROPAGANDA. So many reasons to party on Friday, 21 September. Legendary gay icon Cher is performing a sold out concert at Spark Arena and guys will be flocking to Auckland to see her, and party after the show! We are also celebrating FIVE YEARS of PROPAGANDA! New Zealand’s hottest gay dance party was first launched in the Spring of 2013 and has always played host to the best gay DJs from around the globe. 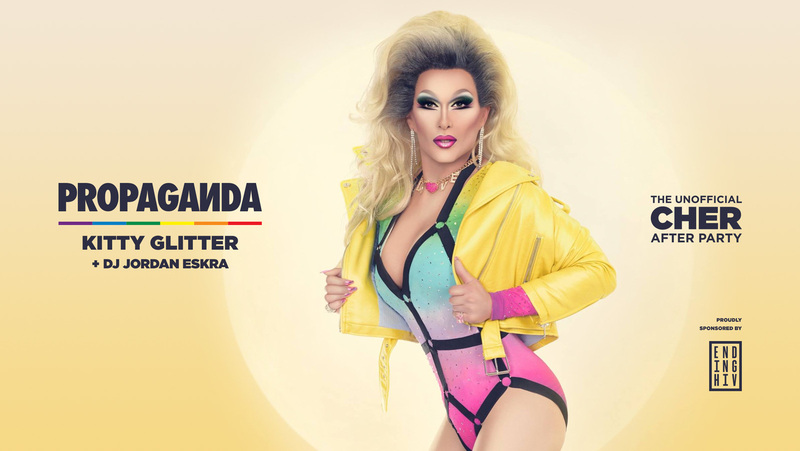 It is beyond fitting that we celebrate this night with the fabulous DJ Kitty Glitter. Kitty has spun at all the major Pride parties around the world and is in high demand throughout the USA and Europe. We are so excited to have her back in NZ for this night! DJ Jordan Eskra will also hit the decks and more to be announced. Goodbye winter, and hello to the gayest night in Auckland this Spring.